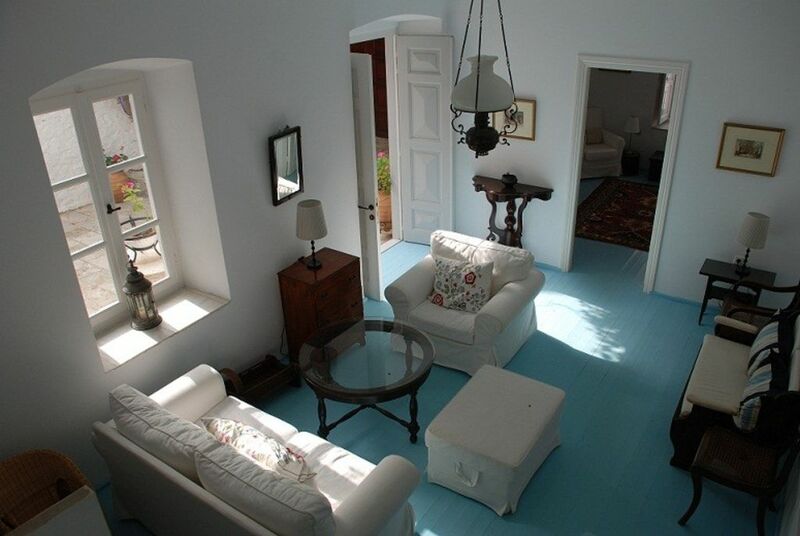 The Courtyard House is an 18th-century stone house in a peaceful but central part of Hydra town. It has the rare advantage of being only a 3 min walk (without steps) from the lovely harbour where all the cafes and shops are. The house has a large secluded courtyard with a lemon tree. This pretty courtyard is surrounded by wisteria and jasmine, an ideal place for a tranquil breakfast. With 3 bedrooms and 3 bathrooms (1 with a bath tub, 2 with showers), the house comfortably sleeps six. However, there is also a sofa bed in one of the sitting rooms for 2 extra guests. Travel cot also available. Decorated in a traditional style, the house has kept its original character, while at the same time has all the comforts of clean, modern living. The kitchen and bathrooms have been renovated in 2010. There are 2 living rooms, a large kitchen, a master bedroom and bathroom and 2 guest bedrooms with en suite bathrooms. All the rooms have lovely high wooden ceilings and wooden floorboards. More about the house: On the first floor, the master bedroom has a double bed and a single bed and use of the main bathroom with bath tub. The master bedroom opens out onto a pretty secluded terrace where one can have quiet cup of coffee or an evening glass of wine surrounded by the smell of jasmine. The other large bedroom on this level has a double bed and its own balcony. It also has its own en suite bathroom. The third bedroom is on the ground floor. It has a double bed and a single bed and it also has an en suite bathroom. The kitchen is large with a family breakfast table and is fully equipped with a toaster, kettle, oven, fridge/freezer, dishwasher, washing machine, cutlery and crockery, etc. Some of the comforts of the Courtyard House include: a DVD player, TV, a fully-equipped kitchen, a dishwasher, a washing machine, air-conditioning, proximity to the harbour and weekly maid service. And finally : Hydra is a treasured getaway from the hustle and bustle of city life. The Courtyard House is a safe haven for little ones, as is Hydra itself. It is a very easy picturesque walk to the harbour without any steps and the lack of cars and mopeds make Hydra an ideal destination. Visitors to the house will be met at the port and shown to the house. Although you will have complete privacy during your stay, assistance or advice will only be a phone call away. We stock the house with an initial supply of bottled water, juice, milk, coffee and tea upon arrival. We also provide a weekly maid service as part of the rental fee. More frequent service can be organised for an additional fee. The bathrooms have all been renovated in 2010 in a classic style. Lovely house in a beautiful and peaceful area of Hydra but so close to the harbour. Everything we needed was in the house. We were 5 adults but there is so much space you really feel comfortable. The owner was extremely helpful and went out of his way to make sure we were comfortable and looked after. Would highly recommend and would love to come here again. Thanks so much for your kind words Linzi. You were great guests and we would love to have you back again! It is always great to have return guests! Thanks for your kind words! Hope we see you again soon in Hydra! Such a beautiful house with lots of room , a private courtyard, upstairs terrasse and nicely decorated and cared for. So nice to have Tracy meet us at the boat and show us the way. Perfect location and not difficult to access even with luggage. Would definitely recommend it to others. You were great guests Melanie! Hope we see you again soon! Amazing place with great outdoor courtyard! Beautiful home! We had a lovely stay. Located super close to everything! Hydra is one of Greece's most beautiful and unspoilt islands. There are no cars, motorbikes or bicycles, donkeys and boats are the only modes of transport. The island is a typical Greek island but is different in that strict preservation laws have ensured that all the old buildings have been beautifully preserved. There are no modern buildings. Just beautiful views, pretty cobbled streets, traditional whitewashed houses with colourful doors, a pretty harbour with tasteful, cosmopolitan shops, cafes and tavernas, pebble beaches, museums and friendly people. One can take pine-scented seaside walks from Hydra town to the nearby village of Kamini. Visitors can also take a day trip to the nearby islands of Aegina, Poros and Spetses. It is close to Athens and therefore easy to get to. Hydra is popular with artists, writers and wealthy Athenians, but it also preserves a traditional way of life that is becoming increasingly hard to find on other Greek islands. Your booking can only be confirmed and guaranteed once the 15% deposit has been received.